Identification: There are currently 17 known species of plants in the United States and 2 in Europe that have been confirmed as hosts for Phytophthora ramorum. The symptoms vary in identified plants. In live oaks (black, coast live oak, shreve’s oak) the first symptom is thick, dark reddish-brown sap oozing from the trunk. In tanoaks, the first sign is dropping of new leaf growth. As the weakened trees are in later stages of decline, decaying fungi are seen on the trunks. Death may occur in oaks and tanoaks within several weeks. In redwoods and Douglas fir, symptoms of the disease are yellowing and discoloration of the needles and small branches. 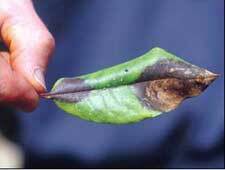 Symptoms in other plants include leaf spots, twig die-back and stem cankers. As these symptoms are similar to those caused by other Phytophthora species, laboratory tests of DNA samples are required to confirm the presence of P. ramorum. 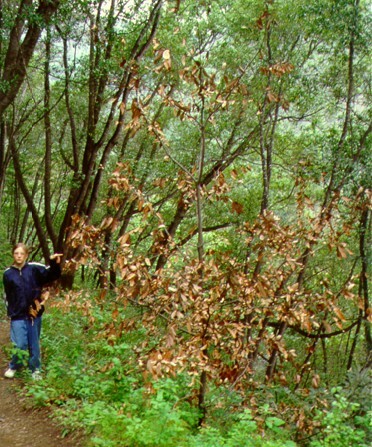 Original Distribution: In 1995, a large number of tanoaks were observed dying in Mill Valley, Marin County, California. The disease was also noted in Western Europe in rhododendrons as early as 1993. The pathogen was identified in July 2000 by researchers from the University of California. Current Distribution: Phytophthora ramorum has been identified in 17 known species of plants in 12 counties and eight state parks in California. The geographic distribution encompasses an area 190 miles by 25 miles and includes the following counties in California: Alameda, Contra Costa, Humboldt, Marin, Mendocino, Monterey, Napa, San Mateo, Santa Clara, Santa Cruz, Solano and Sonoma. The counties that have been most affected are Marin and Santa Cruz. It was recently cited in the southern portion of Oregon. The disease has also been identified in rhododendrons and viburnum in Europe, (primarily Germany, the Netherlands, the UK and Poland). Site and Date of Introduction: Sudden Oak Syndrome was first noted in Mill Valley, Marin County, California in 1995. The disease was later identified as the same disease occurring in nursery plants in Europe as early as 1993. It is believed that the transport of these garden plants is the most probable introduction of the disease. Scientists do not know if the disease was transported from Europe to the United States, or vice versa, or to both places from a third, unknown location. Mode(s) of Introduction: Phytophthora ramorum, the organism that causes Sudden Oak Death, is spread through spores and cysts. 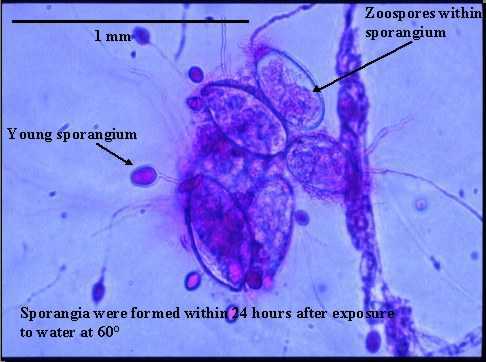 These spores and cysts can be carried in the plant material of hosts. The host will release the spores, which can travel in moist soil and through the air. The spores can accumulate in dead leaves beneath affected trees, which are easily spread. The spores can also be tracked to other areas via people and animals. Reason(s) Why it has Become Established: It is unclear how the disease became established and why it is fatal to some plants and not others. While it was probably introduced into the US, it could also be a native pathogen that evolved in response to environmental changes. Ecological Role: The death of trees is a normal process in a forest ecosystem. Trees die as a result of both abiotic and biotic factors, and in many cases, a combination of both. Trees that are disposed to stress from adverse environmental factors (such as drought, air pollution, compacted soil) are more susceptible to biological factors (such as disease and pests). However, with Phytophthora ramorum, it does not appear that any pre-disposing stress is necessary for infection as the disease infects and kills healthy trees. The aggressive disease has an 80% mortality rate of infected oaks. This alarming level of decline has the potential to severely disrupt the coastal forest ecosystems. Oaks provide habitat and a food supply for a variety of wildlife. In addition, downed trees create a fire hazard. Benefit(s): Pathogens are beneficial in the continued growth of the forest. The death of weak trees can improve the overall health of the forest. In addition, death of trees in a dominant species can allow the regeneration of other species, resulting in increased diversity of plant life. Threat(s): As Phytophthora ramorum appears to be an introduced species with no known cure, the full ecological impact is yet unknown. It is anticipated that Sudden Oak Death will spread to more areas of California and potentially other areas of the United States. Two of the species currently identified as hosts, pin oak and northern red oak, are widespread throughout the Eastern and Midwestern United States. The US Forest Service recently declared these areas as high risk. Since the disease appears to affect some tress and plant species more severely than others and continues to inhabit new hosts, controlling the disease could be problematic. The economic impacts of the disease have already been felt through the quarantine of popular nursery plants exported from California. It is still unclear what impact the disease will have on redwoods and Douglas firs, both of which have a substantial economic impact on the California nursery trade. Douglas firs are a major timber and Christmas tree species (estimated at one billion dollars). Redwood is also valued as timber and mulch for landscaping. Control Method: Quarantine regulations designed to slow the artificial spread of Phytophthora ramorum have been implemented by various state and federal agencies including the California Department of Food and Agriculture, the California Department of Forestry and Fire Protection, Country Agricultural Commissioners, and the US Department of Agriculture. Interstate movement of all confirmed hosts from quarantined areas have been imposed. Regulated materials include forest stock (including nursery stock), bark chip, and mulch. In addition, several counties in California have implemented hazardous tree assessment, removal, and restoration plans. As there is known cure for the disease, it is recommended that trees appearing to be infected are closely monitored. No action should be taken until tests have been conducted to confirm the presence of Phytophthora ramorum. Some trees may escape the disease and those that do not survive should be examined by certified arborist to determine the appropriate course of action. The movement of infected leaves, wood and soil should also be prevented by humans and animals. People who have been in infected areas should clean and disinfect their shoes and vehicle tires.